Why should you move your WordPress.com blog to WordPress.org? Like most other people, you started your first blog on WordPress.com because the service was free, you didn’t require any designer skills, and there were plenty of themes, widgets, etc. to help you customize the blog just the way you want it. Other than Google ads and themes, a big reason why you may want to move from wordpress.com to a personal web domain is branding. A web address like www.yoursitename.com (hosted on WordPress.org) looks far more professional than www.yoursitename.wordpress.com which uses the free WordPress.com platform unless you pay extra to have your own domain mapped to that .com account. How to Move from WordPress.com to WordPress.org? 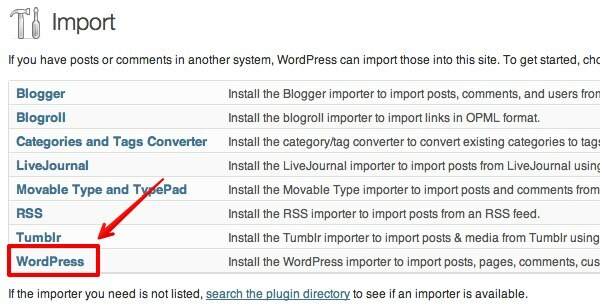 This guide describes how you can easily move a blog from WordPress.com to a personal web domain using a self-hosted version of WordPress blogging software (wordpress.org). If these technical stuffs make your knees knock then there is another easy way. You can use the ‘Guided Transfer‘ offered by WordPress.com. For $129 one of their own engineers will help you transfer your WordPress.com site to WordPress.org. The only condition is that you should host your new site with one of WordPress partner companies which include HostGator, Dreamhost and GoDaddy. To move your blog from WordPress.com to your own domain, you first need to buy a web domain and some server space where you can host that blog. Hosting services that you might consider for your WordPress blog include HostGator, Bluehost, Dreamhost etc. I recommend HostGator for web hosting and Namecheap for domain names. Now let us go back to your old WordPress.com blog and access its admin dashboard. Navigate to Tools –> Export. We can generate an XML file containing your posts and comments. But before exporting you should do a general walkthrough of your blog settings. Make sure everything is in order and make sure that you clean up your old blog by getting rid of spam comments. Here you have the options to generate an XML file or to choose ‘Guided Transfer’ where one of their own engineers will help you transfer your WordPress.com site to WordPress.org. Select the types of content you want to export and download the .xml file to an easily accessible location on your computer. Once you have that file on your desktop, you can breath a little easier considering you are half way through the content migration process. Now that you have the basic infrastructure in place, we shall set up a WordPress blog. Most web hosting companies offer 1-click WordPress installation so this shouldn’t be tricky. After acquiring the hosting account, go to the cPanel of your account and look within the available applications. You will see the WordPress icon, clicking which will take you through a quick installation process. Login in to your brand new site’s admin area. Now let us import the content of the XML file. 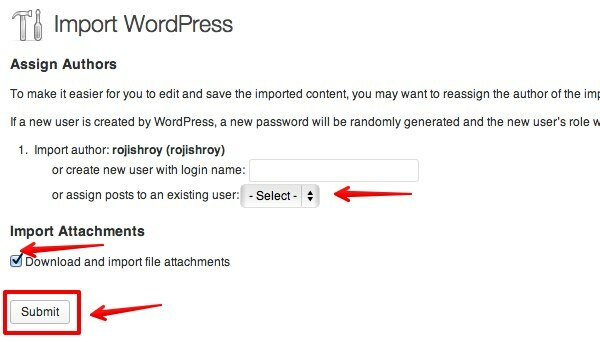 2) From the options listed on the new page choose ‘WordPress‘. 3) You will be asked to install ‘Import’ plugin. Click ‘Install“. 4) Click Activate Plugin & Run Importer. 5) Upload your XML file and click on the button ‘Upload file and import‘. 6) Be sure to correctly assign the authors and to check the option to bring in all attachments. Everything from your old WordPress.com blog, including images and other attachments, will now be imported automatically into your new WordPress.org blog. Your new self-hosted blog might be a mirror of your old WordPress.com site, but visitors and search engines alike, will still land on your old site as there is no way to inform them about the new one. Therefore, we should redirect traffic coming to your old address into your new blog. Doing this will preserve your link juice and lead your loyal readers to the new self-hosted site. Currently, WordPress.com charges $13/ year for site redirect feature. If your site has been around for a while and has a good number of loyal readers then the redirection is worth your money. To purchase this feature go to your WordPress.com blog dashboard. Proceed to store and purchase ‘Site Redirect’. That’s it! Once the redirection is complete, the switch will be invisible to your existing blog subscribers and search traffic. All your older blog links will continue to work, and visitors will be redirected to the new site. You will have to keep renewing the upgrades every year, for using the domain mapping services from WordPress.com. However, I believe one year would be enough time for your old users to memorize your new domain name. Drop a comment below or send me a message if you’re having some trouble and perhaps I can offer some assistance.